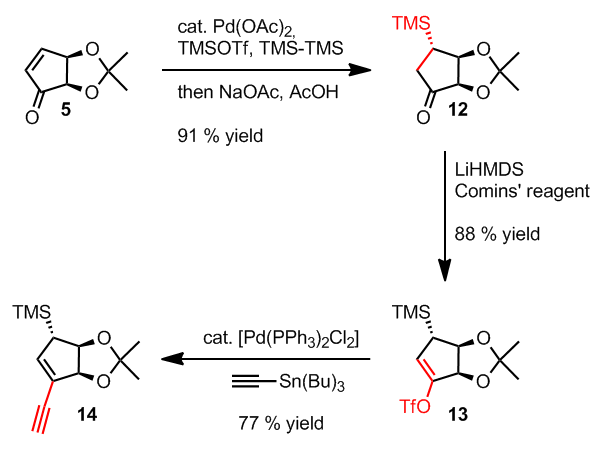 Not so many total syntheses have been published these days but this one caught my attention (some might say for obvious reasons…). Though lasanolide A has been made a couple of times but never in such a neat fashion utilizing some pretty efficient metal catalyzed processes. 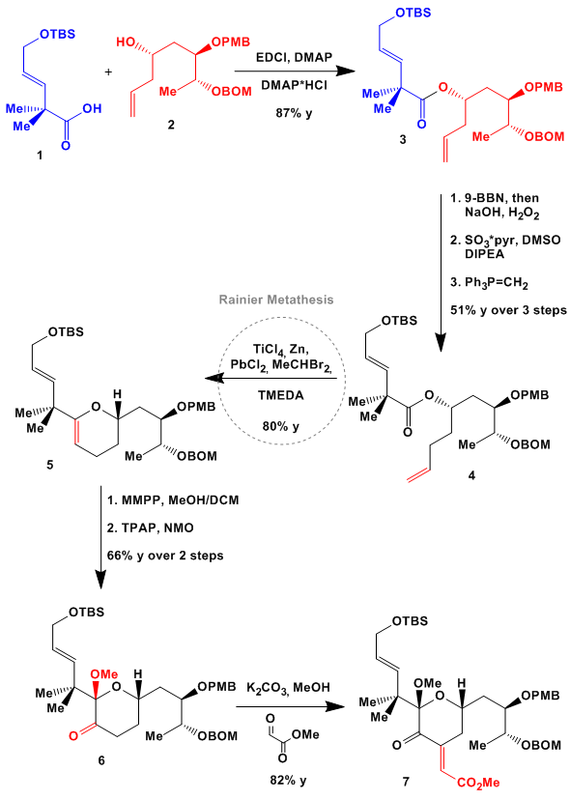 Trost’s retrosynthesis is shown below. The two major fragments were assembled by an intermolecular ruthenium mediated enyne coupling and a Yamaguchi macrocyclization. The western fragment in turn derives from an alkyne precursor to which the side chain is attached by consecutive HWE and Wittig olefinations. The stereochemistry is set by a highly efficient ProPhenol aldol reaction. The eastern fragment also makes use of a HWE olefination and a Hiyama coupling, respectively. A ruthenium catalyzed hydrosilylation and cross metathesis then give retrosynthetically the diol shown whose stereochemical information derives from an enzymatic reduction and an old-school CBS reduction. Starting in the forward sense the side chain of the western fragment was prepared in just four steps. Neopentyl cuprate addition to propargyl alcohol was followed by acetonide cleavage / esterification. TBS protection and formation of the Wittig salt furnished fragment 3 in a pretty efficient manner. The other part of the western fragment originates from a ProPhenol mediated aldol reaction to give 6 in nearly enatiomerically pure form. 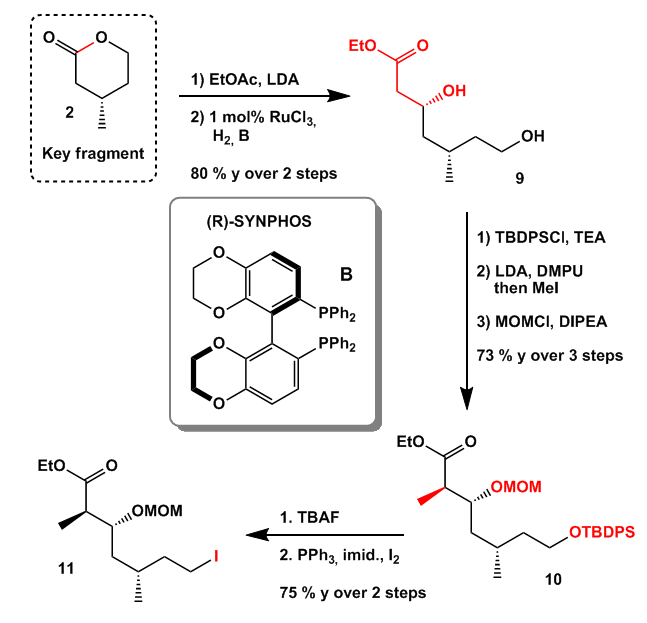 DIBAL reduction and subsequent TBDPS protection was followed by stereoselective acetal formation and Ley oxidation yielding 8. Only one diastereomer is obtained in the acetalization step under thermodynamic conditions. Deprotection of the alcohol directly provided the hemiacetal 9 as an inconsequential mixture of diastereomers. 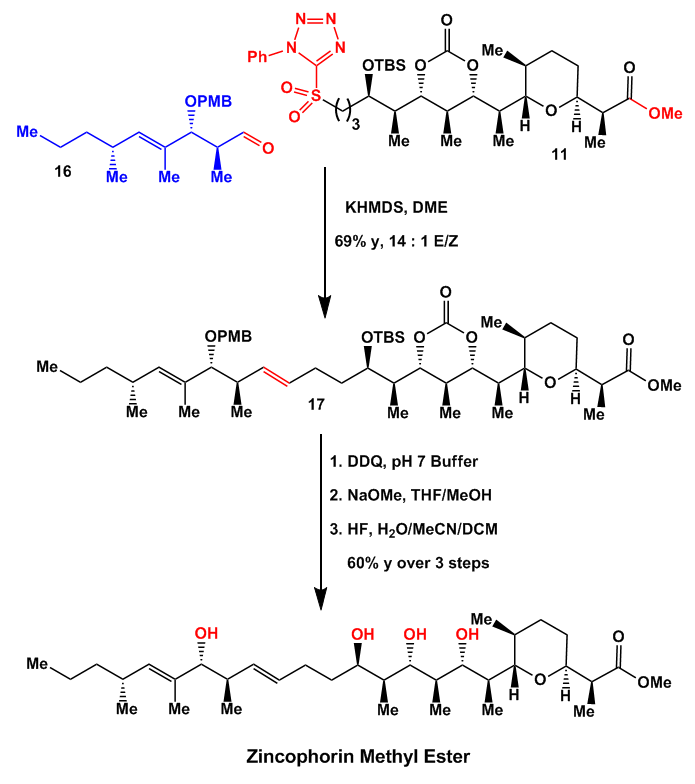 HWE olefination and DIBAL reduction produced aldehyde 10 which could be coupled with 3 in the presence of KHMDS. After a survey of methods the acetal cleavage was preferably accomplished with LiBF4 completing the synthesis of the western fragment. Ok, now let us have look at the synthesis of the eastern fragment. 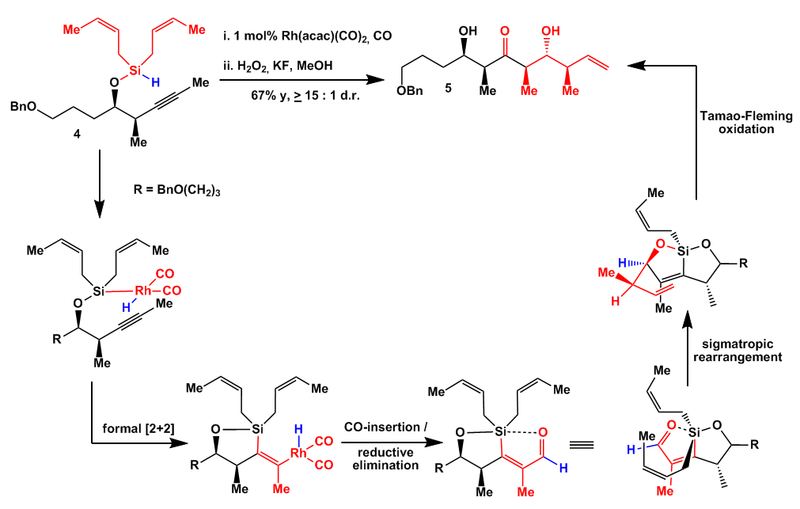 It kicks off with an old school Blaise reaction (Reformatsky with a nitrile) to give dicarbonyl 12 which eventually was reduced to hydroxyester 13 by an enzyme called CDX-024. TIPS-protection and two-step conversion of the ester to ketone 15 was followed by a these-days-rather-rare CBS reduction to propargyl alcohol 16. 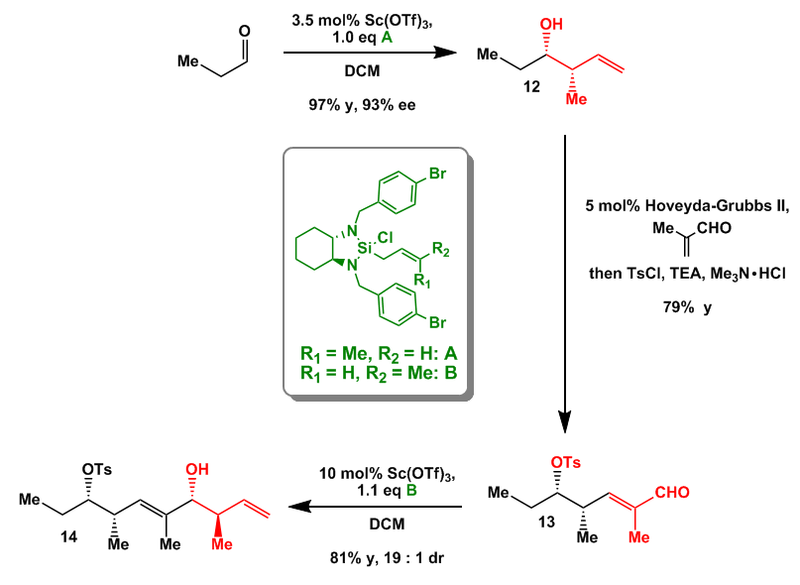 Ensuing trans-selective hydrosilylation developed in the Trost labs and cross-metathesis with crotonaldehyde furnished directly pyran 18. The remaining acid side chain was introduced by HWE olefination using lithium hydroxide in the presence of mole sieves. 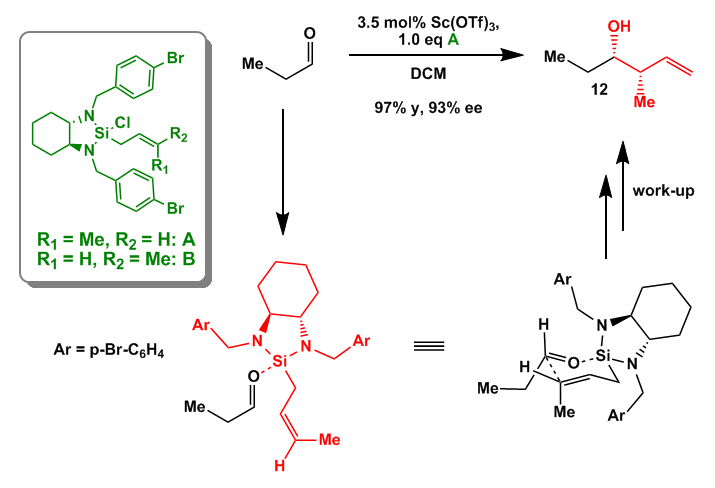 Allylation utilizing a Hiyama-coupling of the vinyl silane, saponification and TBS protection then furnished eastern fragment 22. Completion of the synthesis was brought about by a powerful intermolecular ruthenium mediated enyne coupling giving mainly the linear isomer 23 in a 3 : 1 ratio. This result is rather unprecedented because this reaction usually favors the formation of branched products. As acetone proved to be the most effective solvent in this reaction under the conditions employed the formation of an acetonide was observed which was cleaved off with CSA in an ensuing step. 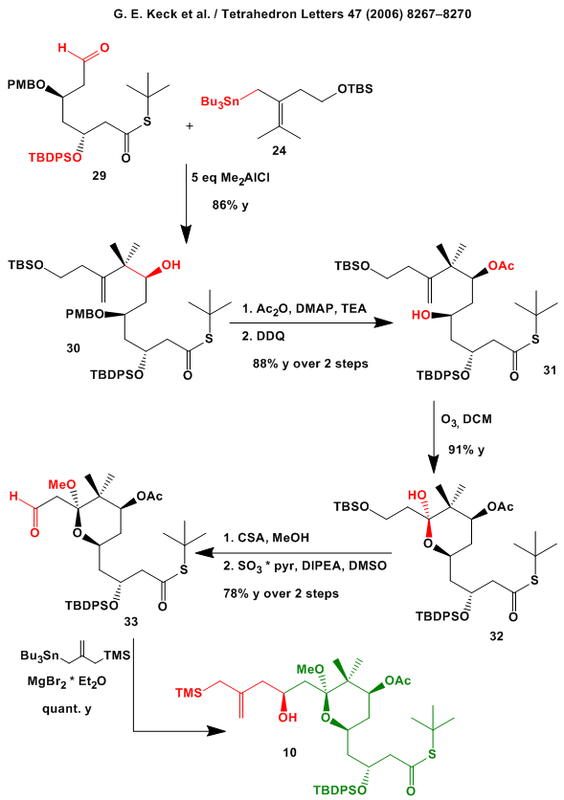 After selective TBS-protection of the three least hindered alcohols the seco acid was closed under Yamaguchi macrolactionization conditions to give after global deprotection lasonolide A in an overall yield of 1.6 % (16 steps LLS with respect to allyl cyanide). A really impressive synthesis relying mainly on powerful transition metal catalyzed transformation. I hope you also liked the quiz… If you have any suggestions please let me know. 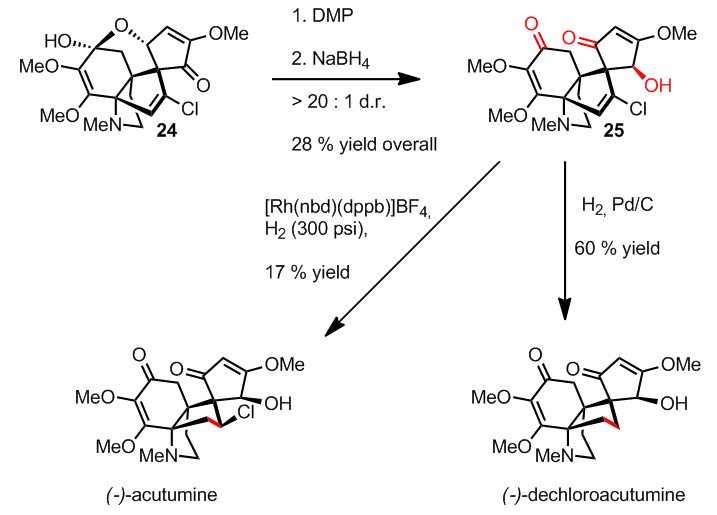 Recently the Herzon group disclosed the neat syntheses of (-)-acutumine and (-)-dechloroacutumine. Driven by the interesting biological features (e.g. inhibition of human T-cell proliferation) and the densely functionalized structure the group devised a versatile approach towards both natural products. 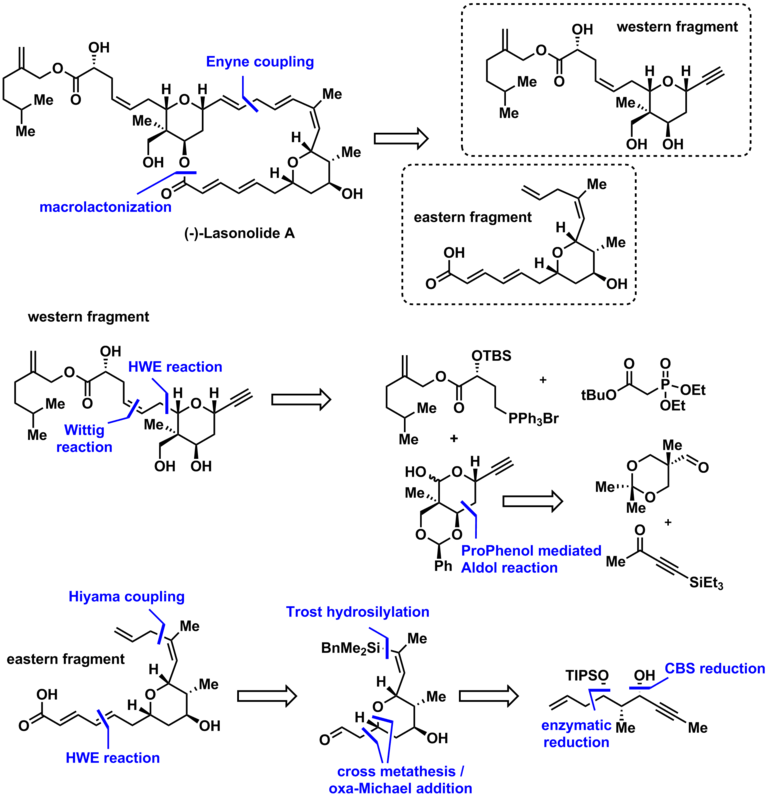 The common tetrahydroindolone core of the acutumines and the hasubanane alkaloids offered the opportunity to rely to some extent on earlier work on hasubanonine and related congeners. The main steps of the synthesis include the earlier employed lithium acetylide addition to an iminium ion, an intramolecular Hosomi-Sakurai reaction and a nice introduction of an unsaturated ketone. The first two fragments are not featured in full detail in the paper so I present them separately. Fragment 5 can easily be accessed in five steps from glucose ribose 1. 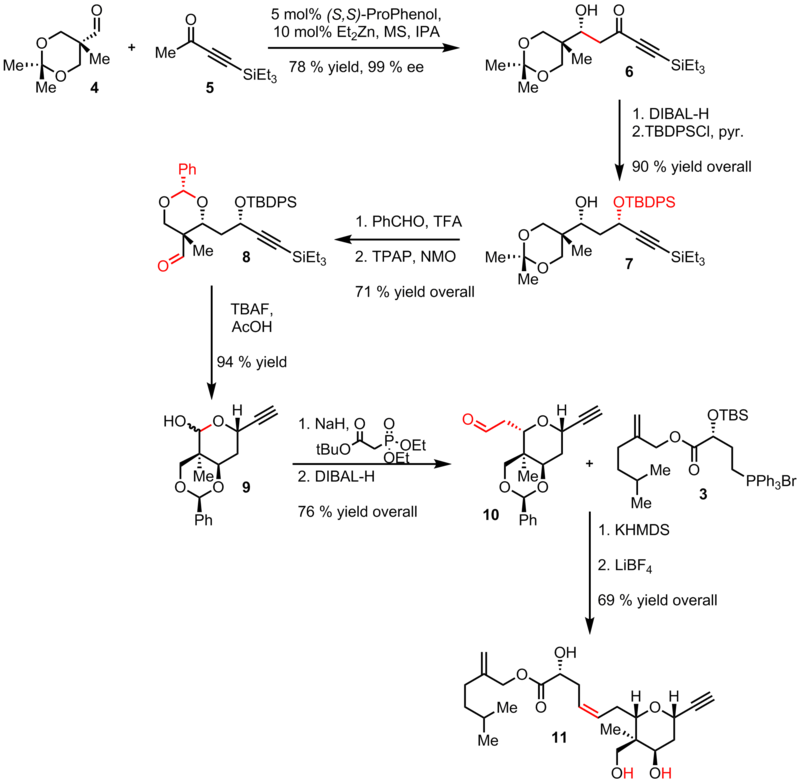 Acetonide and acetal formation was followed by an Appel reaction and concomitant reductive ring opening to give aldehyde 3. Addition of vinyl Grignard, RCM in the presence of Grubbs-I and oxidation of the alcohol yielded known ketone 5 in good overall yield. 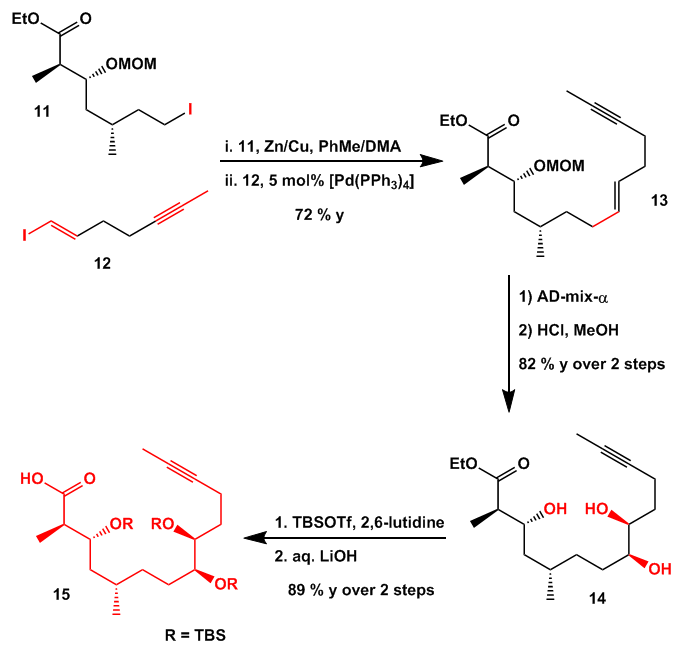 The second fragment was synthesized from trimethoxy acetophenone ketal 6 which underwent an interesting reductive ketal cleavage / hydroboration / oxidation procedure to give alcohol 7. Mesylation and SN2 replacement with sodium azide then furnished 8. 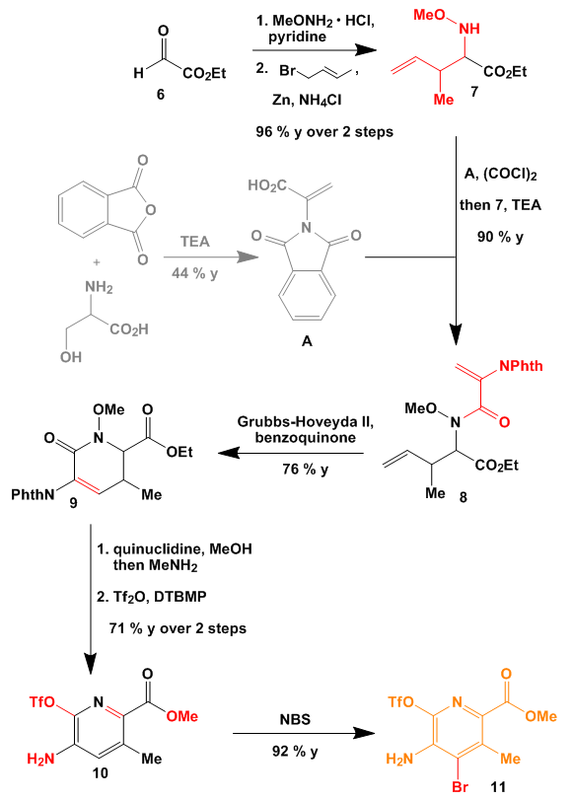 The following sequence of steps has been used in the synthesis of the hasubanane alkaloids. 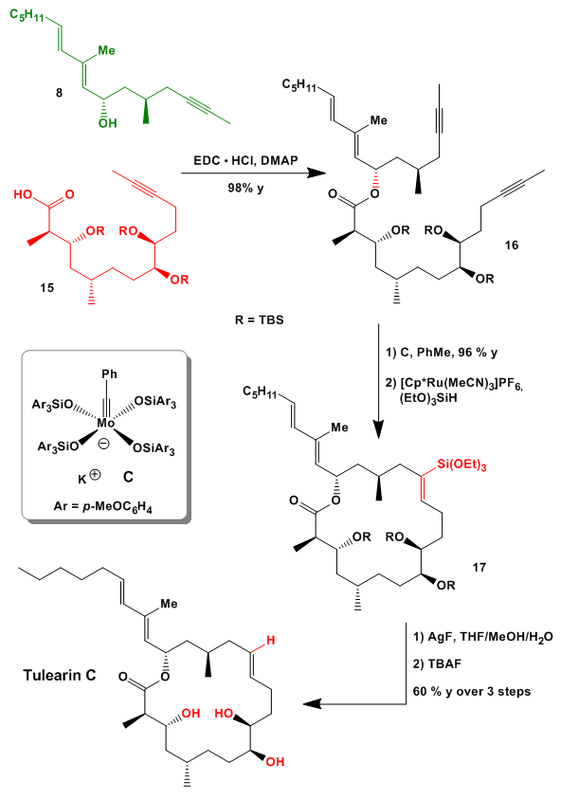 Oxidative dearomatization of 8 was followed by stereoselective Diels Alder reaction of the less hindered double bond. 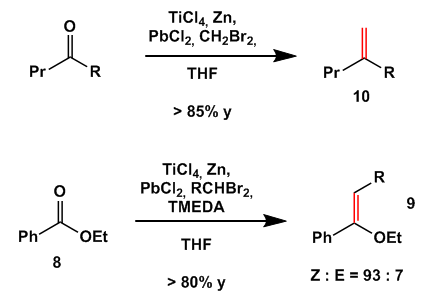 Finally trimethylphosphine mediated Aza-Wittig reaction produced key intermediate 11. 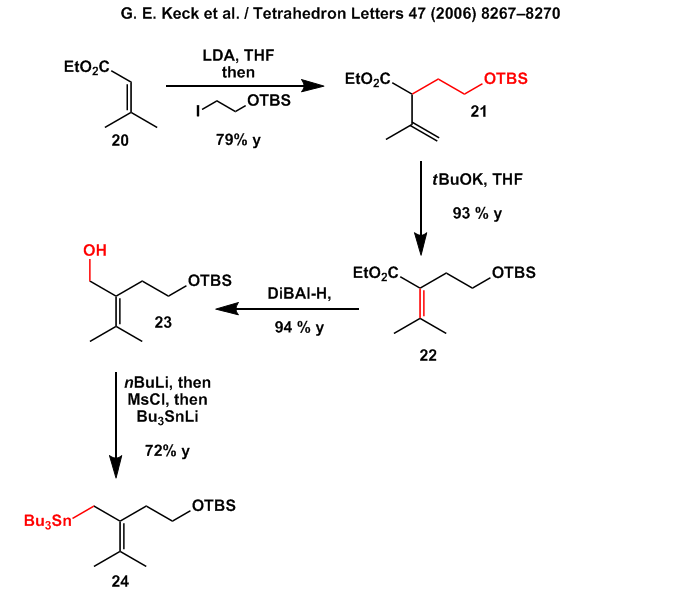 Elaboration of ketone 5 began with stereoselective Michael addition of (TMS)2 in the presence of catalytic Pd(OAc)2 and subsequent cleavage of the resultant TMS enol ether. Enol triflate formation and Stille coupling produced acetylide 14. Next methylation of the imine and addition of the lithium acetylide of 14 furnished a single diastereomer of 15. The diastereoselectivity in this step is not straightforward to explain. Building a model does not help much because addition seems to occur from the concave site which should be less favored. The group offers an explanation in the paper: “The contrasteric diastereoselectivity in the addition step may be due to unfavorable torsional strain within the pyrrolidine ring in the alternate diastereomer”. For related addition products the group had access to X-ray structures which proved the relative stereochemistry. Extrusion of TMS-pentadiene under thermal conditions was followed by regioselective hydrostannylation to give 17. 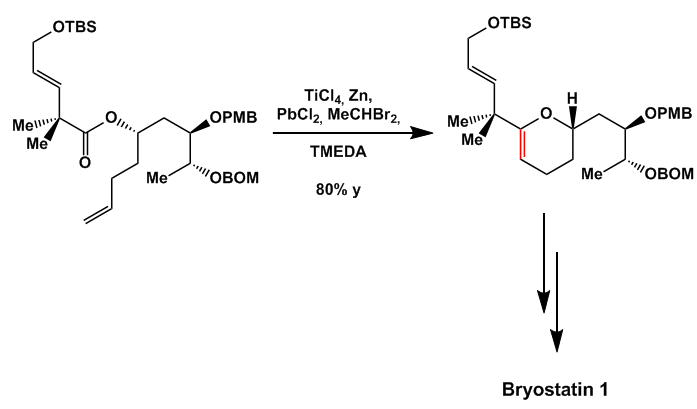 TBAF mediated Hosomi-Sakurai reaction proceeded in moderate yield to close the remaining five-membered ring. 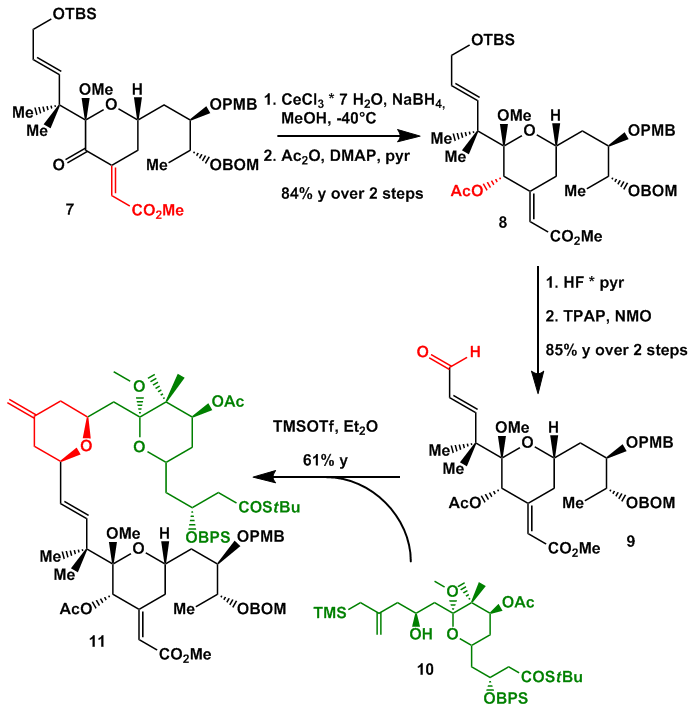 Metal-halogen exchange with CuCl2 and deprotection of the diol then yielded 19. Introduction of the remaining oxygen functionality proved to be fairly difficult. To the end the group had to rely on a rather steppy but successful approach. Oxidation of the diol to the vicinal diketone was followed by methyl sulfide addition and methylation to give 21. 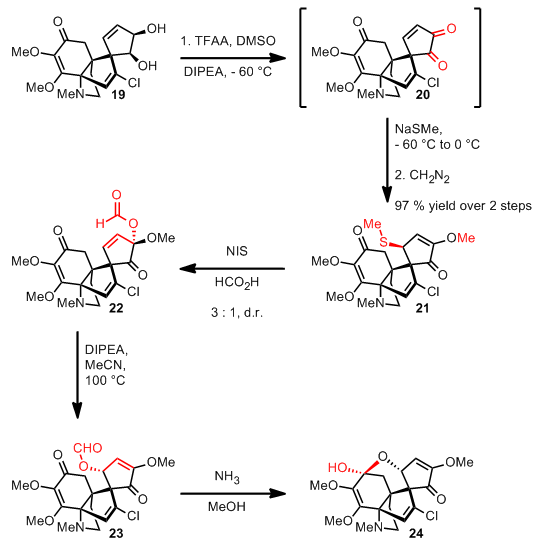 SN2’ replacement by formic acid and thermally induced Claisen rearrangement and subsequent aminolysis furnished hemiketal 24. With fragment 24 only a few steps were left to complete the endeavor. 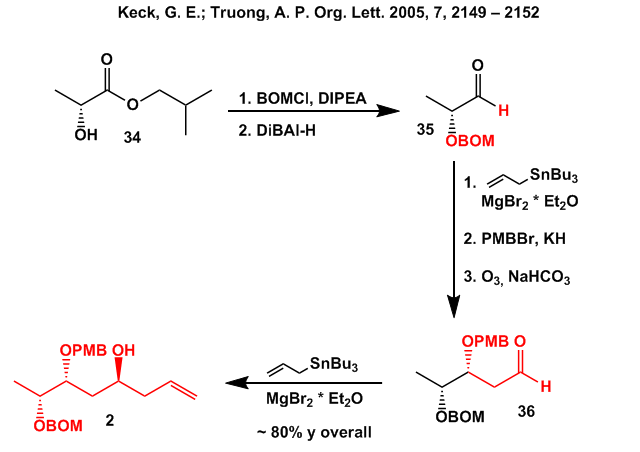 Oxidation of the hemiketal and succeeding reduction with sodium borohydride gave 25 in good overall yield in excellent diastereoselectivity. In the presence of rhodium and high pressure hydrogen 25 was transformed into acutumine in low yield. In the presence of palladium on charcoal beside the double bond the chlorine could be removed to give dechloroacutumine in good yield. Overall a really nice paper which is definitely worth a read. 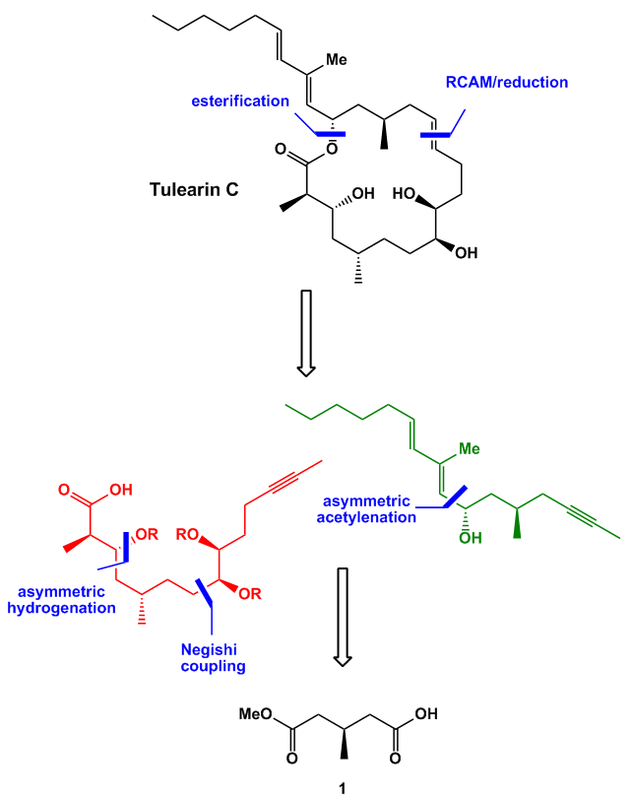 Tulearin C is at first sight a rather simple polyketide natural product. Only seven stereocenters of which only four are contiguous and none of them is quaternary. 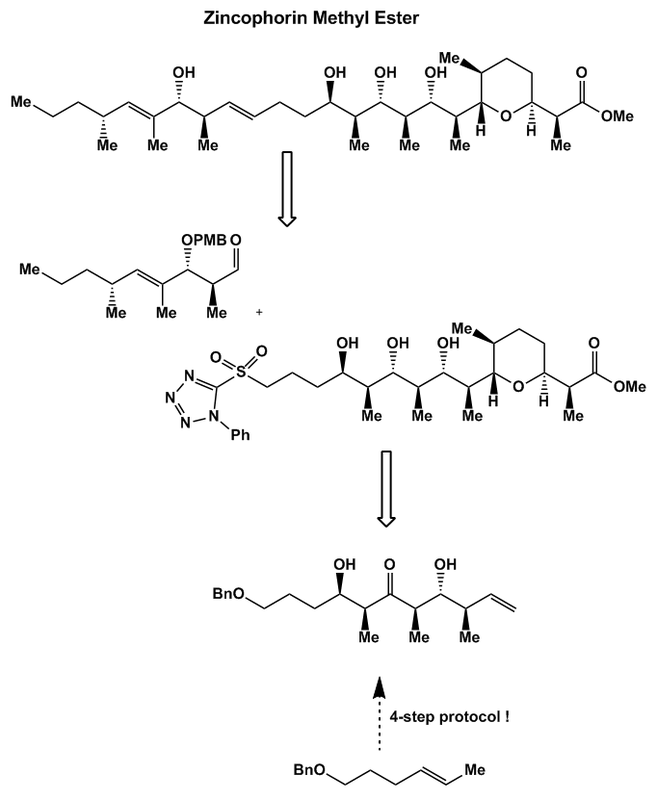 Nevertheless no useful route to this compound has been established to date despite some potential antiproliferative action against human leukaemia cell lines. 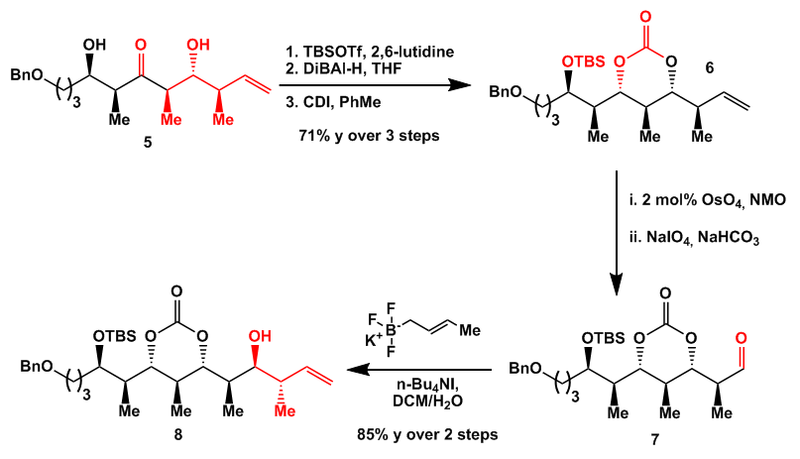 The group around Fürstner built their synthesis upon a RCAM (ring-closing alkyne metathesis) with subsequent trans-selective hydrosilylation/protodesilylation to get the trans alkene. This critical feature was the major problem of earlier approaches which relied on a trans selective RCM which instead gave a mixture of trans and cis alkenes of virtually 2 : 1. Breaking down the molecule into two halves the group reduced the problem to the common starting unit 1. This glutarate monoester is available in large quantities from dimethyl-3-methylglutarate. Desymmetrizing saponification of one of the ester groups with a pig liver esterase (PLE) and further enhancing ee by crystallization of the crude acid with cinchonidine gave ester 1. You should have a look in the SI how they did this interesting saponification. After formation of the lithium salt the ester was reduced to the alcohol and cyclized to give lactone 2. Wittig reaction then furnished dichloride 3 which was reacted with excess methyl lithium to give alcohol 4 and after DMP oxidation aldehyde 5. The key transformation of this scheme is detailed at the end. Aldehyde 5 then underwent stereoselective alkynylation under Carreira’s conditions to give diyne 6. Regioselective reduction of the internal alkyne and quench with iodine was followed by silylation of the free alcohol. The excellent regiocontrol can be ascribed to the alcohol function which guides the Red-Al to the correct end of the triple bond. Palladium catalyzed methylation and subsequent desilylation then furnished the green fragment. Direct introduction of the methyl group in the hydrometallation step with Red-Al did not produce any product at all. The second half of the red fragment was synthesized from butynol. Hydrozirconation with Schwartz’ reagent in the presence of DiBAl-H and iodine quench was followed by triflation and alkynylation to get iodide 12. 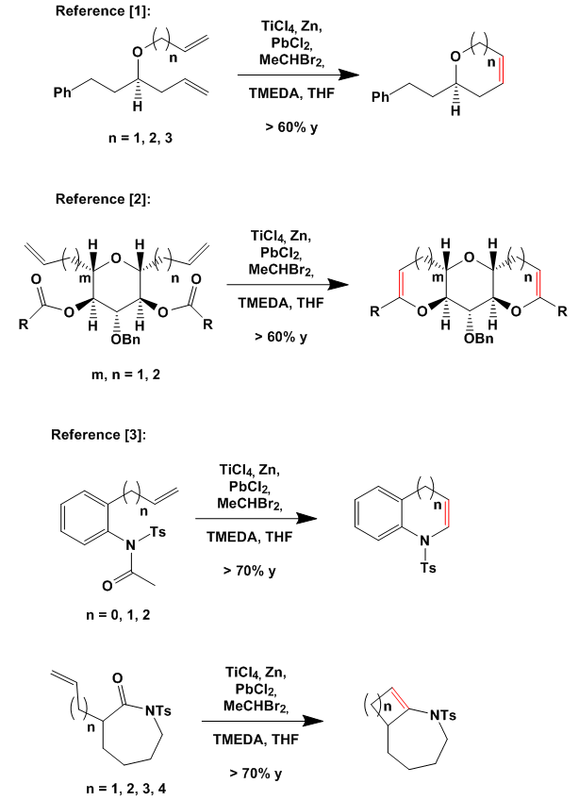 Both parts were combined by first generating the alkylzinc species from 11 which underwent a Negishi coupling with iodide 12. 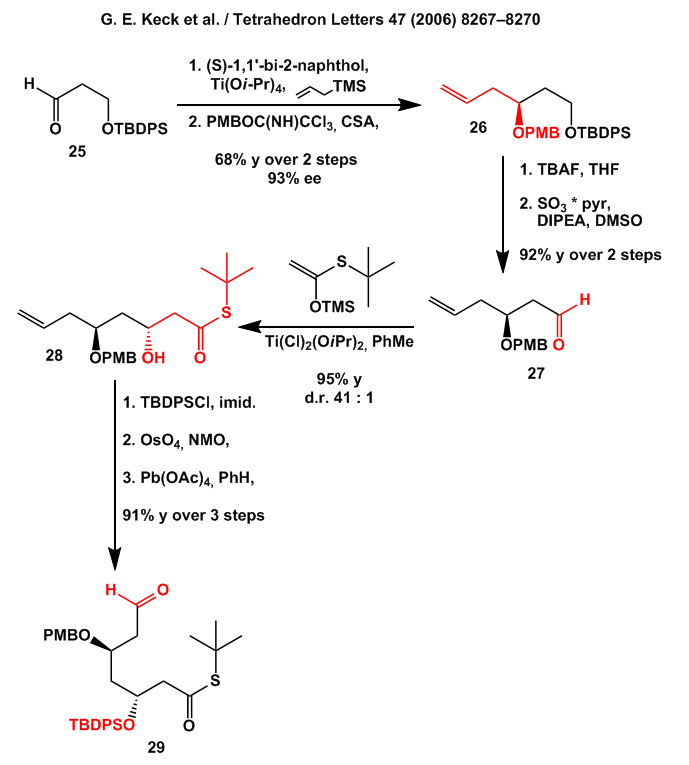 Sharpless dihydroxylation and subsequent MOM cleavage was followed by global TBS protection and saponification of the ester grouping. Esterification of 15 with 8 was accomplished with EDC in almost quantitative yield. RCAM with catalyst C was done in toluene in excellent yield although some heating was necessary. Trans-selective hydrosilylation gave lactone 17 from which the siloxy group was removed with AgF. 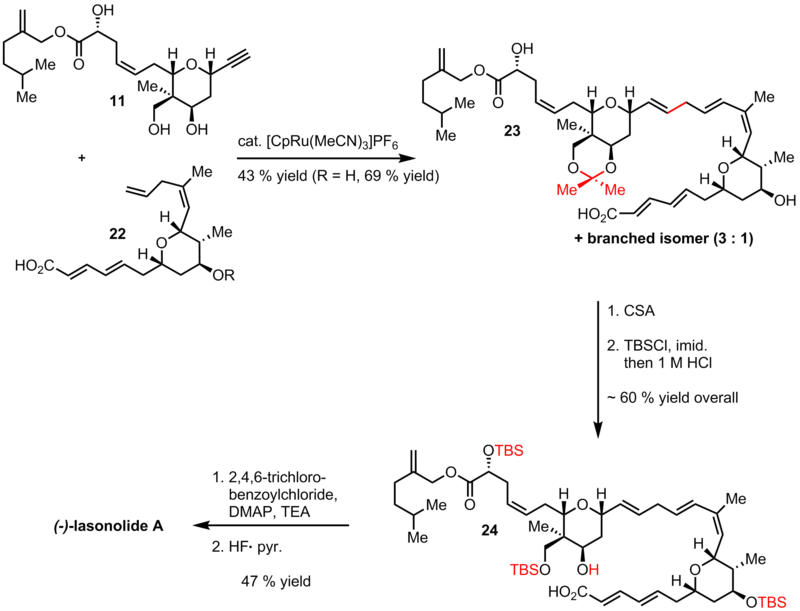 TBS removal under standard conditions then produced Tulearin C.
And here are the details concerning the formation of key fragment 4. It is some kind of Grob fragmentation and I would compare it to the well known Eschenmoser fragmentation. Two possible reaction pathways are shown in the paper of which the left one is preferred. As can easily be seen from the scheme the first step is a metal-halogen exchange to give a carbenoid-like carbon atom. 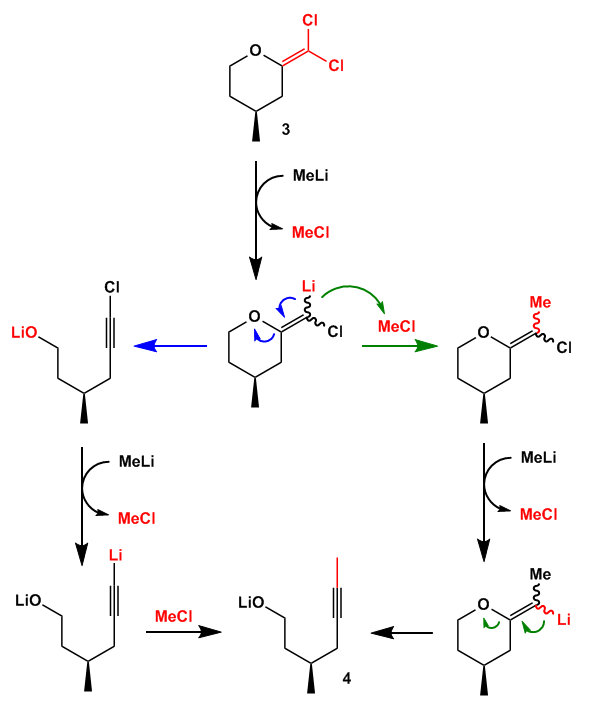 The next step might on the one hand be an intramolecular E2-reaction to give the acetylenic chloride which undergoes another metal-halogen exchange and subsequent alkylation with in situ formed MeCl (blue arrows). Or alternatively the vinyl-lithium species is alkylated with in situ formed MeCl before the second chloride atom undergoes a metal-halogen exchange and further fragmentation (green arrows). Independent of the intermediates the same product is formed in good yield. 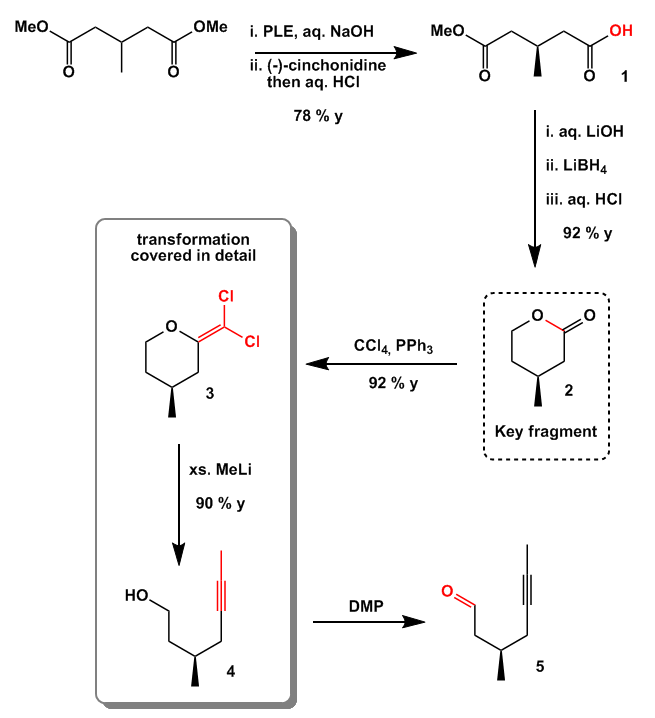 In the original paper some applications of this transformation are shown and a detailed investigation of the mechanism and further application are underway. Also two examples are shown in which allenes instead of alkynes are formed. As usual exceptionally good stuff from the Fürstner group. And big thanx to Bobby for proofreading. Streptonigrin is a rather interesting natural product because of its axial chirality between rings C and D which was determined to be M. It contains a highly substituted quinoline dione system connected to a pentasubstituted pyridine ring. 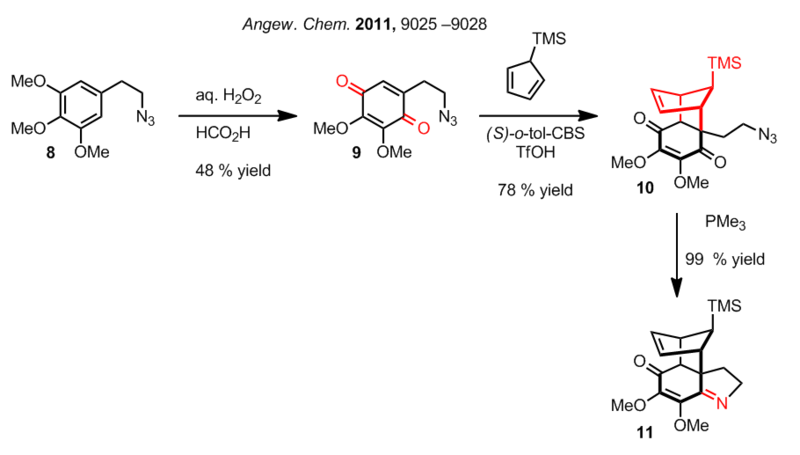 Only a handful of total syntheses are known to date and none of them, as it is true for this one, devises an enantioselective route towards the target compound. 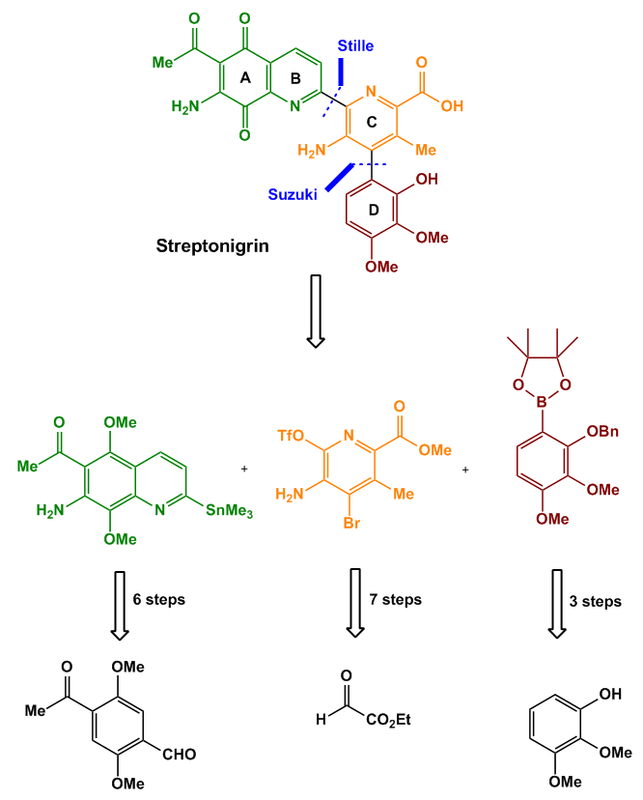 Nevertheless, compared to the previously described routes this one furnished (±)-Streptonigrin in a respectable yield of 11% over 14 steps (LLS). The group planned an iterative route in which the main fragments were coupled using standard palladium chemistry. By using this approach three fragments are retrosynthetically received. The synthesis of the green fragment commenced with benzaldehyde 1 which was nitrated ipso with respect to the carbonyl and reduced to give aniline 2. Acylation and subsequent cyclization was followed by chlorination to give quinoline 4. After some experimentation the group found stannane 5 to be the most reliable intermediate for the crucial C-C-bond forming step. The resulting stannane was used without further purification. Next the orange fragment was synthesized starting from ethyl glyoxalate 6. 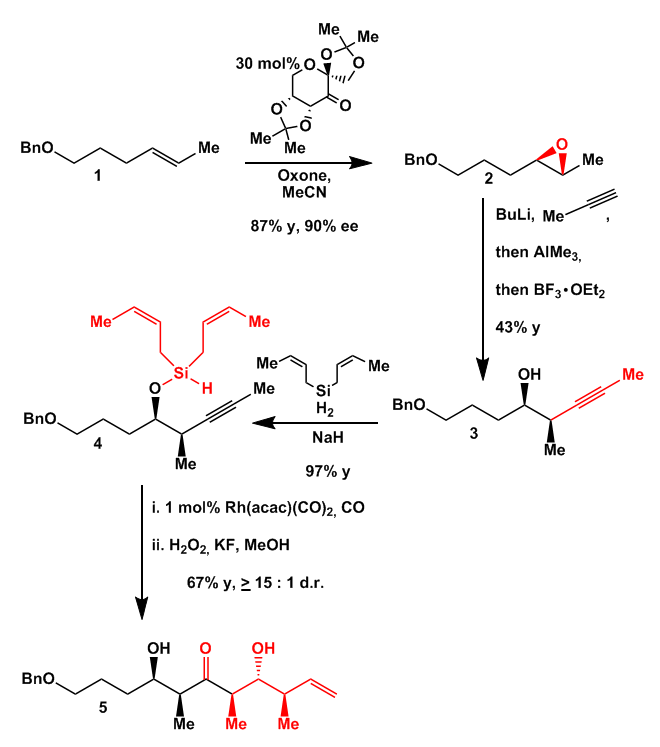 Oxime formation was followed by regioselective crotylated to give methoxyamino ester 7. Amidation with phthalimide A after acid chloride formation gave amide 8. RCM employing Hoveyda-Grubbs II worked uneventfully to give pyridone 9. The presence of benzoquinone was necessary to prevent isomerization of the double bond by quenching the Ru-H species formed in situ. After elimination of methanol and triflate formation the resulting pyridine was brominated with NBS to give 11. The last fragment was completed within 3 steps. Bromination of phenol 12 with NBS was followed by benzylation and boronate formation to give 14. Fragments 5 and 11 were then coupled under old school conditions using tetrakis to give 15 which was reacted with 14 to give 16 again in the presence of tetrakis. 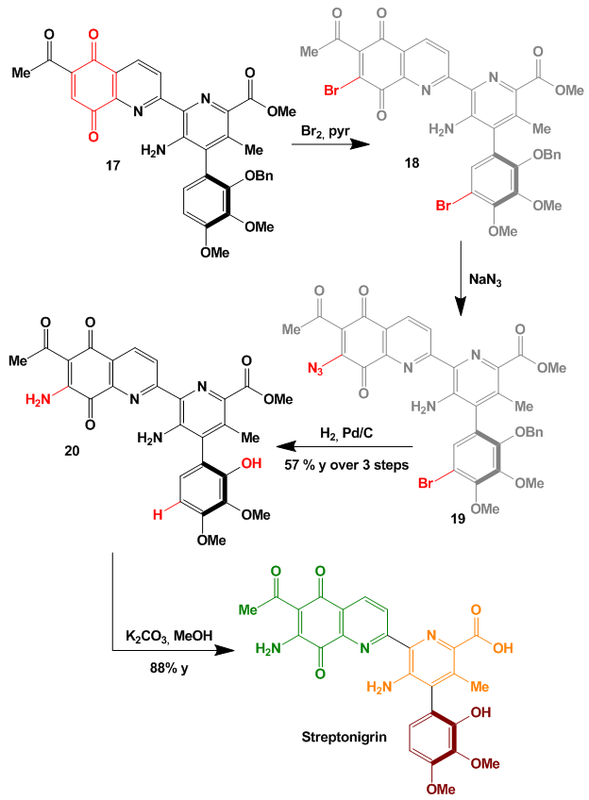 Oxidation of the quinoline fragment then gave quinoline dione 17 in very good yield. All previous syntheses relied on the endgame of the Weinreb paper published in 1980 going on from intermediate 17. Nevertheless the Donohoe group decided to construct their own endgame. Bromination of 17 produced a dibrominated product 18 which was directly reacted with sodium azide to give compound 19 which in turn was converted into pyridine 20 through hydrogenation with palladium on charcoal. In the latter step the azide was reduced to the amine, the bromine reductively removed, and the benzyl protecting group cleaved off. After saponification racemic Streptonigrin was obtained. Very nice stuff and no polyketides anywhere. THX to Bobby for proofreading. O yeah, what a beauty J The current paper deals only with the last 24 steps so a closer look in the literature and supporting information unveiled the remaining “few” steps. If you want to read more stuff about the whole story you should have a look in the many references mentioned in the original paper. 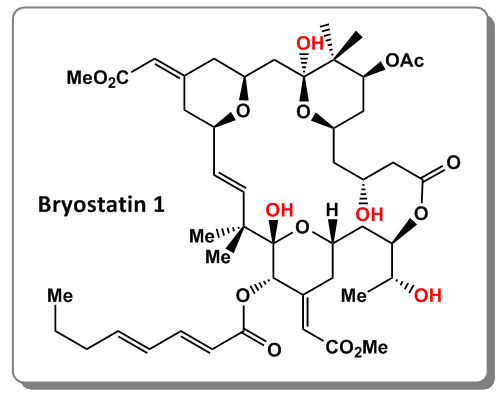 So what’s it all about with these Bryostatins? As mentioned in the paper Bryostatin 1 for example exhibits some action against diabetes, stroke, cancer and Alzheimer’s disease. It is assumed that this action is a result of the strong interaction with protein kinase C isozymes. Again, more details can be found in the references. I will start my review with the syntheses of some key fragments which are later used in the main paper mentioned above. The blue fragment was available in four simple steps from ester 16: Allylation was followed by a Wohl-Ziegler bromination, a modified Williamson ether synthesis and simple saponification of the ester to give acid 1. The second half was synthesized starting from isobutyl lactate 34. BOM-protection and DiBAl-H reduction gave aldehyde 35. 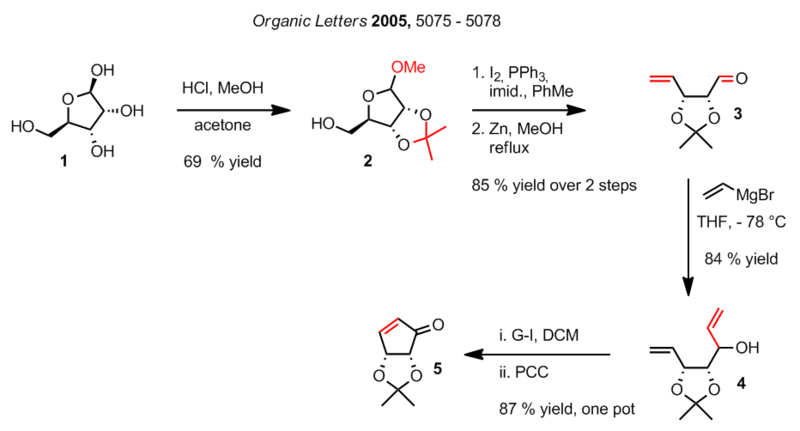 Stereoselective allylation, PMB-protection and ozonolysis furnished aldehyde 36 which in turn was allylated to give fragment 2 in about 80% overall yield. Fragment 1 and 2 were combined under standard Esterification conditions to give 3. 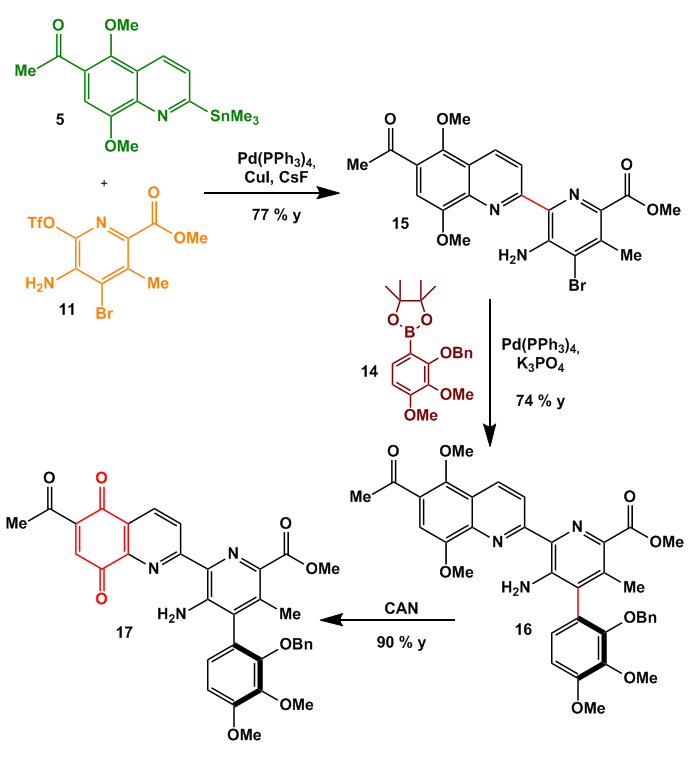 The olefin was extended by a three step protocol involving oxidative boronation, Parrikh-Doering oxidation and Wittig methylenation to furnish 4. 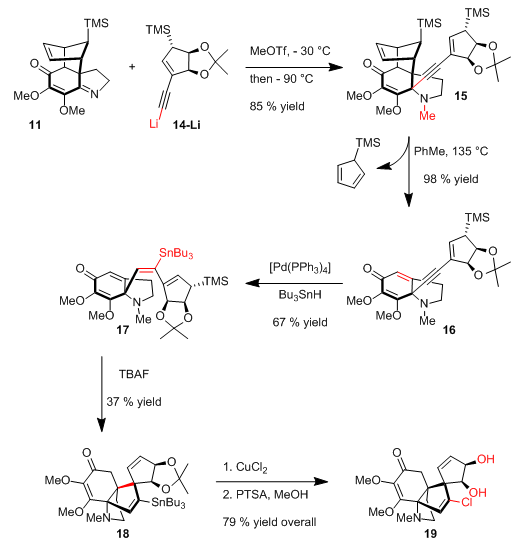 This underwent a nice Rainier metathesis reaction, which I presented to you last month, to close the pyran ring and gave 5. 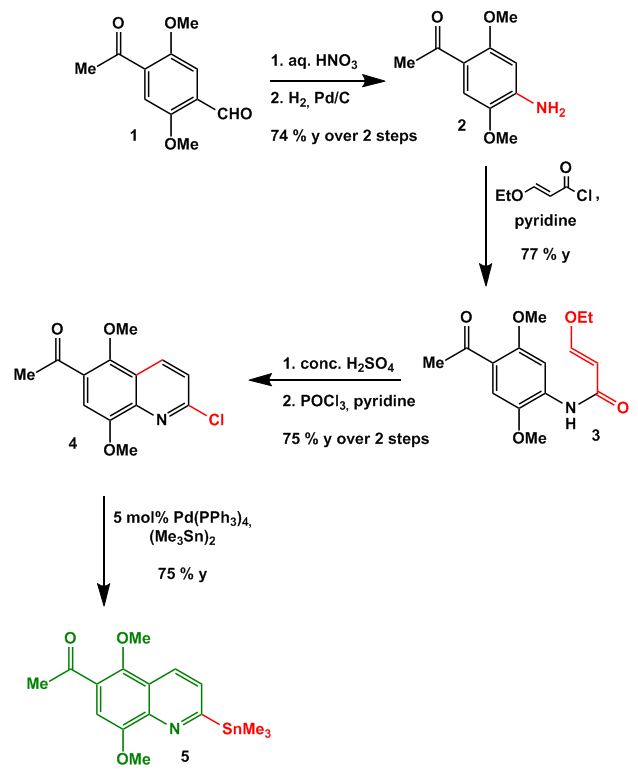 Epoxidation with MMPP (a more soluble substitute for the more familiar mCBPA) and in situ opening of the epoxide with methanol was followed by Ley oxidation and aldol condensation with methyl glyoxalate to give ketone 7. Luche reduction of the ketone and immediate trapping of the alcohol with acetic acid anhydride produced 8. TBS cleavage with HF and Ley oxidation with TPAP yielded aldehyde 9 which was reacted with homoallyl alcohol 10 in the presence of TMSOTf to give 11. 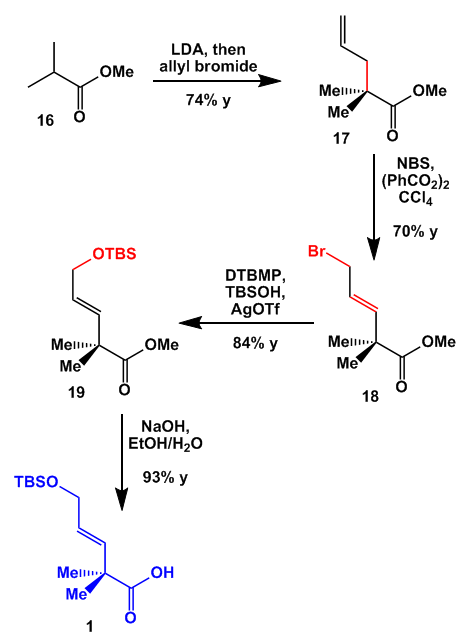 The synthesis of the green fragment is discussed next before we move on with the synthesis. Ester 20 was alkylated and isomerized with tBuOK to give 22. Complete DiBAl-H reduction gave alcohol 23 which was deprotonated / mesylated / stannylated in a one pot reaction to give 24. The second half of the fragment was synthesized starting with aldehyde 25. A stereoselective Mukaiyama aldol reaction was followed by PMB-protection of the free alcohol to give 26. 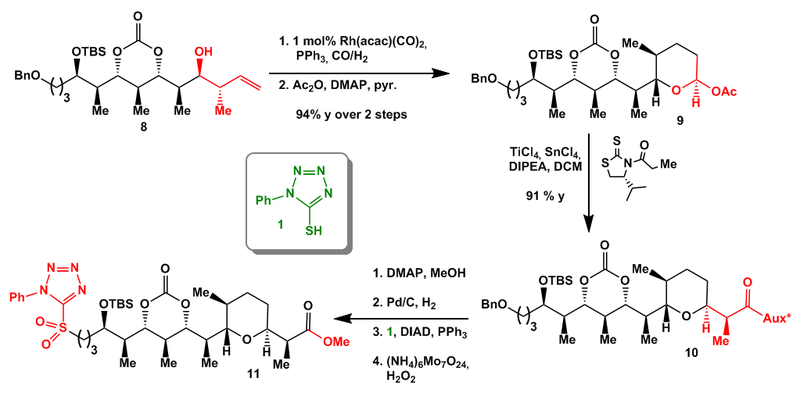 Deprotection of the silylated alcohol and Parrikh-Doering oxidation was followed by another nice substrate controlled Mukaiyama aldol reaction to give 28. 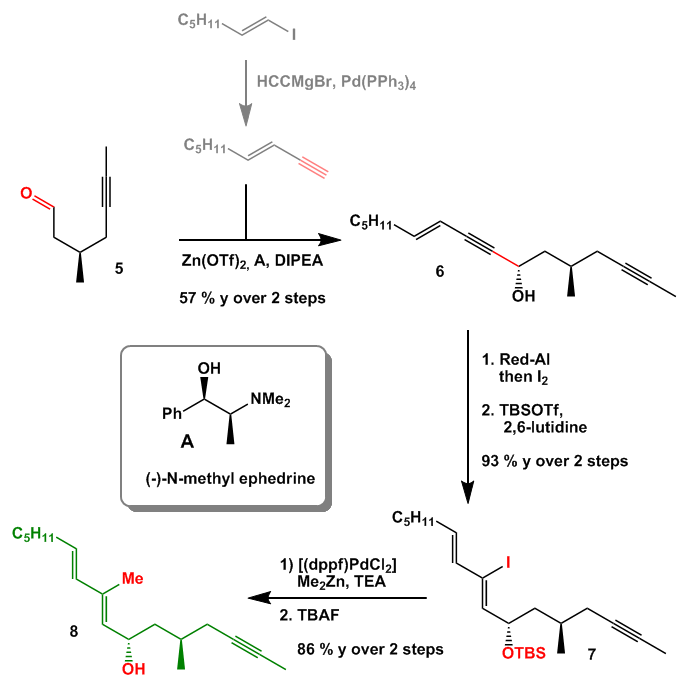 Silylation, dihydroxylation and lead mediated diol cleavage (Criegee oxidation) gave 29. Next Me2AlCl mediated allylation of aldehyde 29 with allyl stannane 24 gave alcohol 30 as a single diastereomer. 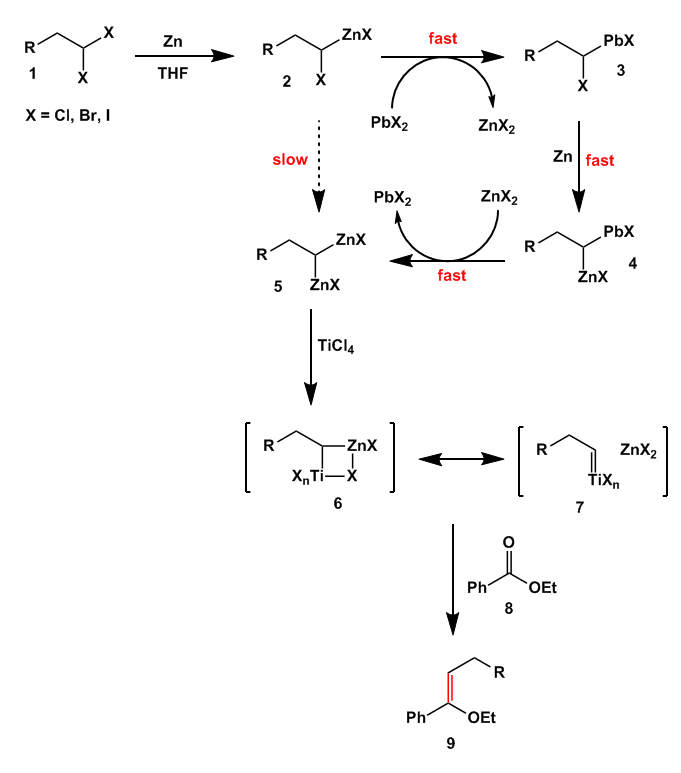 Acetylation and PMB-cleavage under standard conditions was followed by ozonolysis to give 32. The hemiacetal was converted to a full acetal with methanol / CSA while the TBS group was cleaved off, the free alcohol oxidized and allylated to give the red / green fragment 10. The BPS-group (better known as TBDPS) was cleaved off with HF, the thiolester hydrolysed in the presence of H2O2 and the free alcohol trapped as the TES ether 12. PMB-cleavage was followed by Yamaguchi macrolactonization to give lactone 13 whose exo-methylene group was dihydroxylated and oxidized to ketone 14. The ketone was used to introduce the last ester group by employing a HWE-reaction with Fuji’s chiral phosphonate A to give 15. 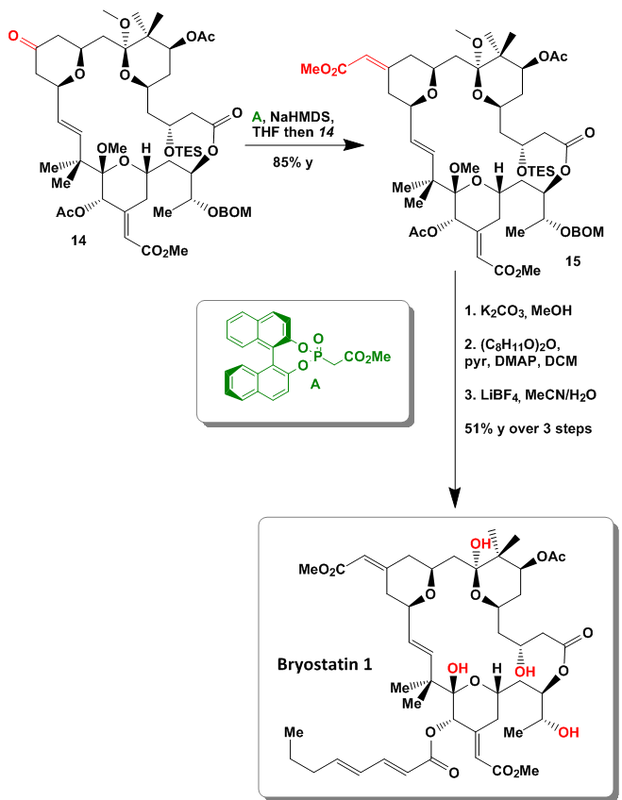 Selective acetate cleavage, esterification and global deprotection with LiBF4 then produced Bryostatin 1 as a single diastereomer. 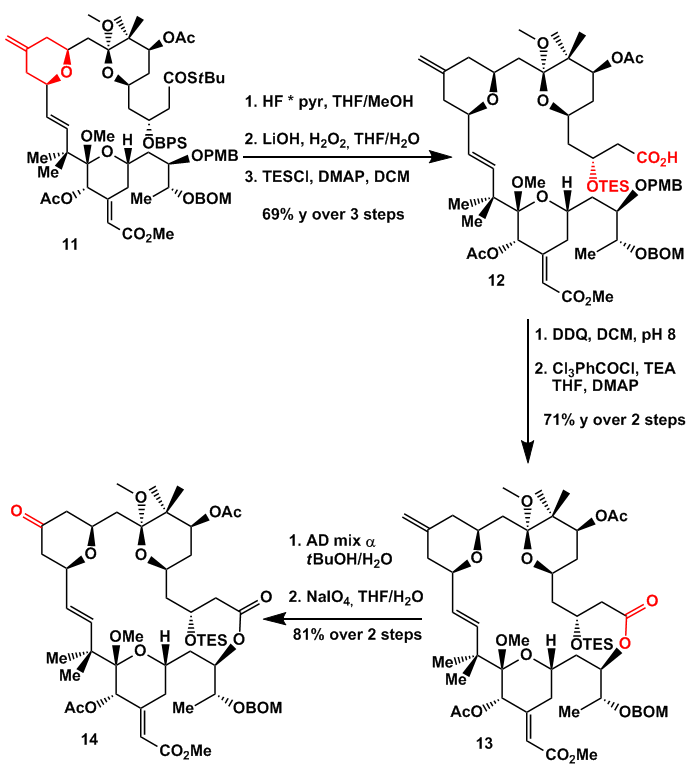 Man, what a long synthesis but extremely cool. Hope you enjoyed reading this and hopefully you have some suggestions and comments for me… It really took me some time to get an overlook and find all the widespread papers.